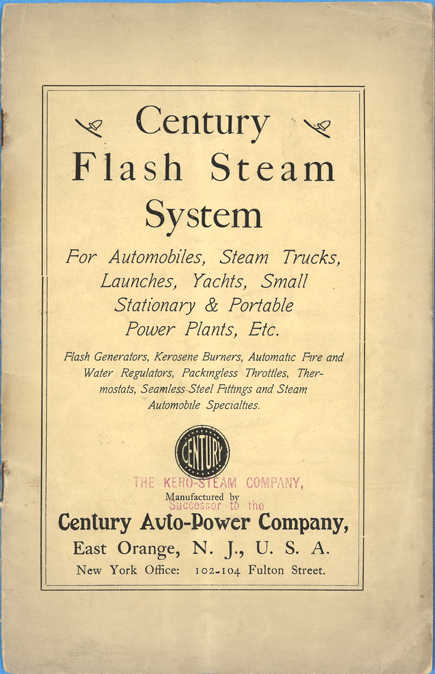 The Century Auto-Power Company produced a Flash Steam System as an after market item for steam cars. Its catalogue listed a number of other steam automobile items. Note the stamp on the fron cover The Kero-Steam Company, Successor to the Century Auto-Power Company. This Kero-Steam Company/Century Auto-Power Company catalogue documents the fluid nature of the early automobile after market business.